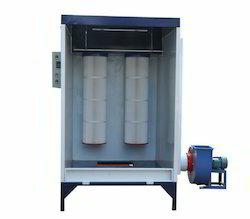 Leading Manufacturer of powder coating booth from Pune. Large Size Powder Coating Booths are available as per customer’s requirements. Powder Coating Booths are also available with Flame proof motors & accessories for specific requirements and also available in Stainless Steel construction. Looking for Powder Coating Booths ?